“When other planes are grounded, this pilot heads straight for the storm!” says a recent Washington Post profile. Meet that pilot: hurricane hunter and NOAA Corps Officer Captain Catherine A. Martin. 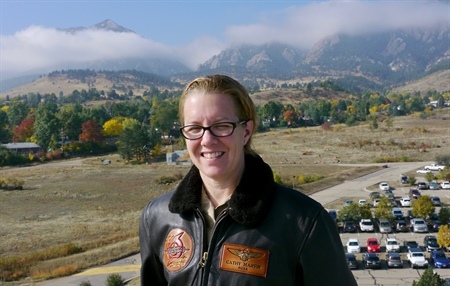 Moving from her former position as Chief of Operations at the NOAA Aircraft Operations Center in Lakeland, Florida, Martin has landed in Boulder, where she is now Executive Director of NOAA Boulder Laboratories. “Captain Martin has 18 years with the NOAA Commissioned Officer Corps, so she brings a wealth of experience and a valuable perspective to NOAA Boulder,” says Robert Webb, Director of the NOAA Earth System Research Laboratory. Four of NOAA’s six line offices (OAR, NWS, NESDIS, and NOS) are present in Boulder—and since the NOAA Corps supports all of the agency’s research, this is familiar ground for Martin. In her new position, Martin will be managing common site services such as IT, outreach and communications, and the library. She will also coordinate site safety and security. In a nod to her earlier work, “I’m also looking forward to helping our scientists get time on NOAA aircraft and working on the Unmanned Aircraft Systems Program,” says Martin. NOAA Corps' Captain Cathy Martin, Chief of Operations at the NOAA Aircraft Operations Center in Lakeland, Florida, is now the executive director of NOAA's David Skaggs Research Center in Boulder, CO.
Martin has had a varied and adventurous career. The North Andover, Massachusetts native graduated from the Florida Institute of Technology with a B.S. in Aviation Management/Flight Technology and a B.S. in Aviation Meteorology. Once she completed basic officer training in the NOAA Corps (2000), she fulfilled a two-year stint on the NOAA Ship Ronald H. Brown. After qualifying as an aviator, Martin worked at the NWS National Operational Hydrologic Remote Sensing Center in Chanhassen, Minnesota. There she flew a NOAA Gulfstream Commander two-engine turboprop to measure the water content of snowpack. In 2007, she was selected to fly NOAA’s heavy aircraft and trained with the Navy for two years before returning to MacDill Air Force Base in Tampa, Florida. After her rotation at MacDill, Martin transferred to NOAA Headquarters as Chief of Staff before becoming the Chief of Operations at the NOAA Aircraft Operations Center in Lakeland. She joined NOAA Boulder at the beginning of October. Reflecting on her career in a recent documentary on women’s service in the NOAA Corps, Martin spoke about the most important values NOAA has given her: independence and teamwork. “Independence has allowed me to get where I am in my career. But I love my career because of the teamwork that I’m actually able to be a part of.” As Executive Director of the NOAA Boulder Laboratories, CAPT Martin will have a lot of opportunities to work with and lead teams. Welcome to the job!